Students in Columbus held an ag fashion show last week. The Columbus seventh and eighth graders learned about Gel electrophoresis last week in class. National Chapter Award: The 2018-2019 officer team has begun its work on the National Chapter application. There are three areas including Growing Leaders, Building Community and Strengthening Agriculture. Each of these three areas has five quality standards. Columbus FFA has an activity for all 15-quality standards. The officers are selecting their best three in each area to share their goals, plan of action and results obtained. This application will be submitted to the Wisconsin Association of FFA and will be scored by judges and then ranked against more than 260 other FFA chapters in the state. Columbus is hoping to continue their performance and rank in the top ten and advance to the national level of competition. The chapter has grown a lot over three years and the FFA members have developed a number of activities and events to create a quality FFA chapter and Program of Activities. This involves a lot of planning, organizing and communication between members, teachers, administration and the community. The FFA members learn important leadership and employability skills as they prepare for each of their events. CDE Practice Continues: The Meats Evaluation Team, Horse Team, Ag Sales Team and Dairy teams continue to practice to prepare for their state competition coming up at the end of the month. The students are practicing their identification skills, observation skills and communication skills in order to put forth their best effort at the state competition. The FFA Career Development Event will include more than 2000 FFA members from around the state competing in 18 different areas from Floriculture to Farm Business Management. Columbus FFA has grown its chapter teams from three to five teams in the past three years. This is a great opportunity for FFA members to apply their classroom knowledge and communication skills in a competitive event. National Chapter Award: Application due April 20. State FFA Career Development Event: Friday, April 26 at UW-Madison. Arbor Day Trees: The Columbus FFA has ordered free trees to give to the fourth grade students to celebrate Arbor Day. The FFA chapter would like to help make a connection for the students from their fourth grade maple syrup unit to the sixth grade Food, Forest and Wildlife class Wisconsin Tree unit to the high school Wisconsin Forestry and Wildlife class forestry unit. The students will hopefully plant their trees in fourth grade and have it grow until they reach high school to make connections as they grow and advance through their agricultural education experience. Wisconsin Forestry and Wildlife: The students have been learning about Wisconsin wildlife mammals by sharing their wildlife research presentations. The students also looked at extinct species and began looking into wildlife management. The class is going to develop a better understanding of how important wildlife management practices are and the impact just one species can have on an environment. The class checked their track boxes this week and found some had been totally demolished by larger critters or had been moved by the wind. A couple of boxes did show some tracks. Food, Forests and Wildlife: The sixth grade students learned about agricultural careers this week and held an Agricultural Career Fashion Show. The students researched a career that closely matched their interests and then dressed up and shared key facts about the career. There were a lot of veterinarians and animal scientists in the group. The class began learning about Wisconsin agricultural products at the end of the week and completed an A to Z list of commodities. The students have selected one Wisconsin Ag commodity to learn more about and share with their peers. 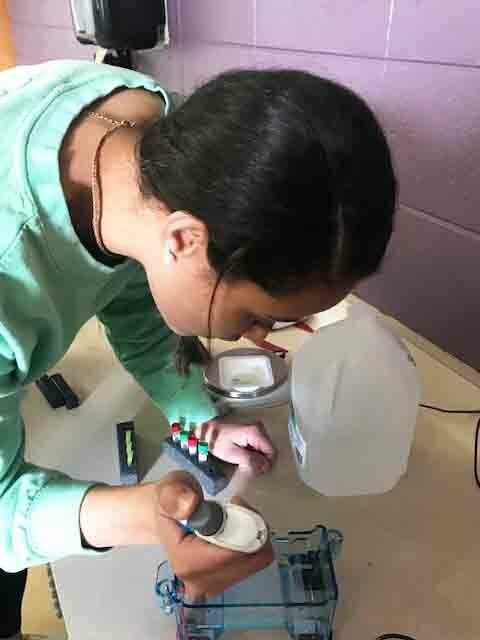 Pizza, Pets and Plants: The seventh and eighth graders learned about Gel electrophoresis this week. They learned how to set up the apparatus and then ran an electrophoresis to see how it worked. They ran DNA dyes to see which one had the most was negative charged. The students were surprised how fast the DNA moved through the gel and how difficult it is to use a micropipette to fill the wells in the gel with the samples to be tested. The class started its food science unit with an activity researching a food innovation and creating a resume for that innovation.